(Photo: REUTERS / Siphiwe Sibeko)Miners on strike chant slogans as they march in Nkaneng township outside the Lonmin mine in Rustenburg May 14, 2014. About 1,000 stick-wielding strikers gathered outside Lonmin's Marikana platinum mine in South Africa on Wednesday, preventing workers from breaking the longest and costliest bout of industrial action the sector's history. Some of the protesting strikers, clad in the green shirts of the Association of Mineworkers and Construction Union (AMCU), told Reuters they were there to block anyone from reaching the shafts. South Africa produces more platinum and similar metals than any other nation, but some in the country see the precious mineral as a curse these days. In 2005, 78 percent of the world's platinum was produced in South Africa, along with 39 percent of the world's palladium, according the CIA Factbook. But those minerals are at the forefront of South Africa's longest running strike. 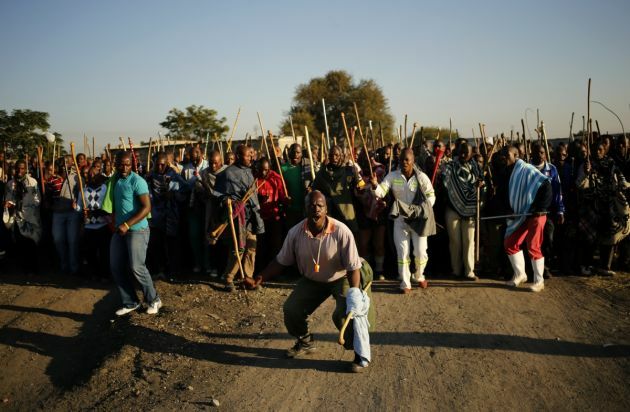 It has turned violent and caused tensions in the mining town of Marikana where in 2102 a similar strike resulted in the deaths of 44 people, many of them when police fired bullets at miners. Such is the national fear that this strike will spiral into more violence that the South Africa's Anglican leader Archbishop Thabo Makgoba of Cape Town issued a prayer Friday to be read in parishes on Sunday. In the prayer he points to something amiss in the economy of South Africa, Africa's richest, but where the gap between rich and poor is one of the biggest in the world. "Lord, there is something amiss in this economic system and we know it," says Makgoba's prayer. "Help us to uphold the dignity of all involved in the current dispute. "Give us the courage to stand for all, especially for the miners. Let us hold before us a vision of fairness and accountability as we pursue what makes for peace." South Africa's biggest platinum producer was unable to persuade miners back to work this week after 16 weeks of striking. The union leading the strike urged workers not to return to work, and thousands of miners arrived Wednesday at a stadium near Lonmin's Marikana platinum mine to show they did not want to go back to work. Lonmin said on Thursday it would consider going to court to stop the strike due to the levels of violence faced by workers who want to return to work, Reuters news agency reported. Anglo American Platinum and Impala Platinum have also been hit by the wage strike by the Association of Mineworkers and Construction Union (AMCU). Four miners were killed at the weekend after some miners were readying to return at Amplats and Lonmin. Implats' main operations around the platinum belt town of Rustenburg remain completely shut. "Lord, we are still mourning and grieving. We are still searching for the full truth about Marikana," says Makgoba's prayer. "Lord, we cannot go there again. "We can't kill and maim to sustain inequality, nor can we allow the fight for equality to kill others."